Last fall two researchers from a Chinese Communist Party think tank peppered me with question’s about the Nuclear Security Summit. Six months before the event they were preparing a position paper for the Central Committee. They said the Party leadership believed it would be an important international event. So, a question is why China saw its participation as important. U.S. press coverage of China’s participation has focused exclusively on Iran, and the intimations of NSC Senior Director for Asian Affairs Jeffrey Bader that China may be willing to alter their position on possible UN sanctions. But the Chinese Foreign Ministry immediately batted down rumors of a U.S. – China agreement on Iran sanctions at a press conference the day after Bader’s announcement. That did not stop the U.S. press and U.S. arms control advocates from declaring an agreement with China on Iran a major accomplishment of the summit, but it’s worth asking what China’s goal for the summit may have been. 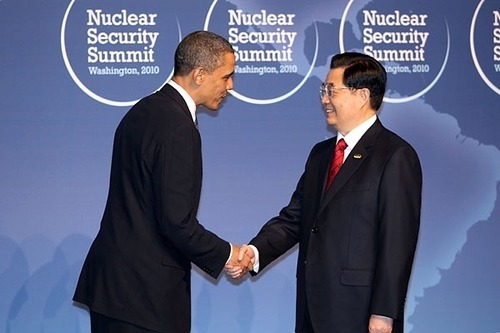 The early inquiries on the summit by the Central Committee, the feature coverage in the Chinese press and the focus of Hu Jintao’s remarks at the summit suggest that the Chinese leadership planned to take advantage of this opportunity to address an unprecedented gathering of world leaders on how to set guidelines for the global governance of nuclear technology. While the U.S. focused on nuclear terrorism and the proliferation of nuclear weapons, President Hu opened with an emphasis on the economic importance of access to nuclear energy and the role nuclear energy could play in combating climate change. Later, while recognizing the need to strengthen nuclear security, be on guard against nuclear terrorism, and prevent the proliferation of nuclear weapons, Hu also stressed the importance of protecting the rights of developing nations to access and develop their own nuclear energy. Hu seemed to be positioning China as a leader of the developing world and as an honest broker between the nuclear and non-nuclear weapons states on the question of how to resolve the inherent contradiction between promoting the development of nuclear energy and preventing the proliferation of nuclear weapons. While the Obama administration would like to characterize Chinese attendance as a diplomatic victory for the United States, it may be that China came to advance their own agenda rather than to curry favor with the administration or to signal a significant change in their position on Iran at the UN.